ANNIE B. JONES: on quitting. You know how I said I wanted to be Kathleen Kelly? My dad reminded me that, really, I'm doing just what she did. That scene, Dad said, that scene where she's talking to Birdie! That's you! "You are daring to imagine that you could have a different life. Oh, I know it doesn't feel like that. You feel like a big fat failure now. But you're not. You are marching into the unknown armed with... Nothing. Have a sandwich." Oh, Dad. I love you. And a good sandwich. So below is an excerpt from my final paper for my classical rhetoric course, entitled Why I Quit Grad School. I'll let you know how that goes over. And yes, it is true. I took a Socratic logic course in my undergraduate studies, so when some of the principles from the class came up in my graduate rhetoric course, I was thrilled. Socrates had this idea that all knowledge is imbedded inside of us already; any truth we reach is really more of a reminder of something our soul already knows. I like that idea, mostly because it makes sense to me, and because I get a feeling — a light bulb feeling — that I can’t really explain. Now it makes more sense. I got that feeling a few times in my rhetoric class this semester, I’m sure due to the fact that I already had learned it in some other class somewhere before. But the concept of the soul is a little more romantic, so I like it better. Whatever the reason, I’d like to present this Socratic syllogism and logically argue why my graduate education has, in fact, convinced me to quit graduate school. Annie is a member of mankind. I’m pretty sure that’s a terrible syllogism, but let’s go with it. I think for so long, I’ve been convinced that smart = educated, and educated = one or more degrees. But the more people I meet and the longer I live, the less I think that’s true. I think the smart ones are the ones who can say no to things, who learn on their own time and their own terms, who seek knowledge somewhere other than the library. My granddad and I were close. Really close. He died when I was 13, but I still like to think he’s watching, looking, seeing what I’m up to. My mom tells me that Papa always thought I was smart, special. He was a grandfather; I’m sure he thought all 40 of his grandkids were special. We did have kind of a bond, though, so maybe he meant something else with me. He used to watch me as I read and wrote (profound things, like “Papa’s Big Blue Chair,” my first literary masterpiece), and he told my mother that the reason I was smart wasn’t because I had some natural ability, but because I knew where to look. “She’s always looking for answers,” he’d say. I’ve found some answers in graduate school, but they weren’t the ones I was looking for. That’s okay. They taught me something anyway. And I think that’s what I’ve taken away from this experience. That smart doesn’t need an M.A. degree. It just needs to always be looking for answers. As long as I do that, I think I’ll be fine. So I’ve decided. I’m quitting graduate school. One day, a semester from now or years from now, I might come back, armed with better reasons and a more stable, balanced life to introduce to academia. But if that day doesn’t come, I think I’ll be okay. It’s been a painful decision. I don’t actually think quitting is as easy as we make it out to be. It’s hard to admit that a dream you’ve had might no longer fit, might need a little adjusting. I know, of course, that this decision won’t solve everything. My life will still have a little bit of chaos, and I suspect there will be days I ache to be back inside a classroom, stretching, growing. It’s still, I think, where part of me belongs. But reflection is good. Rest is good. Self-evaluation is good. And as the semester closes, I have a feeling now that was not here before, and I can feel it filling me up. A peace. A sigh of relief. Things are going to get better now. I can sort of tell these things. Closing the store is the brave thing to do! 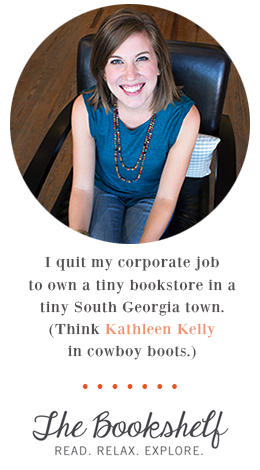 You DO want to be Kathleen Kelly! Awesome. You've Got Mail is the sum of all wisdom. Very brave (and I LOVE that movie). I took a break from medicine right smack in the middle of it to recharge and write. It was the best decision I ever made. Good luck with everything! I think that sometimes, for high achievers, it is hard to admit when it is time to quit (speaking from experience). Feelings of failure seep in, trying to tear down our person and question what we know is right in our hearts. When I was in college I quit leading in a ministry and it was one of the hardest thing I had to do - but the benefits on the flip side was an experience of growth in my relationship with God that I never had before. A few years later, He led me right back to the same ministry - but this time with a healed heart and clear call. So kudos to you for making the brave, hard decision you've made! Life is too short to be miserable and God is clearly taking you on a new path ahead. Can't wait to see what unfolds!! This was actually really illuminating to me. I am considering grad school, but I need to make sure it is what I want and need first. You are very intelligent, and that much is obvious. As usual, Annie, your writing states things so beautifully and contains so much wisdom. I look forward to having a more in depth conversation soon! And your dad is awesome. good for you. its so hard to admit that sometimes what you thought you wanted just isn't quite right or that the path has shifted and changed. but you're better and braver for it. I admire you, Annie Butterworth Jones. I loved this post. It's inspiring. And it's incredibly brave of you to quit grad school. I'm an undergrad English major, so I think it's super cool that you took a classical rhetoric course! I just came across your blog and it was very comforting to know that I share a similar experience with someone else. I also left graduate school not too long ago and it was probably one of the most difficult decisions I have ever had to make. I am still struggling with the aftermath and life isn't much greener on the other side right now but everything happens for a reason. It's a minor setback and hopefully, we can both rise above it and become stronger individuals. Thank you for sharing your experience because your words mean everything!